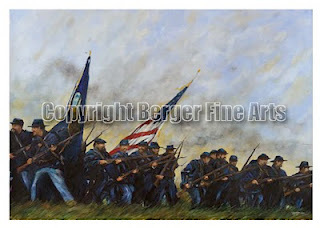 I have finally finished this painting "The Spartans Of Gettysburg" after about 7 variations. I wanted to capture the moment at Gettysburg when the First Minnesota Volunteers all 262 of them were ordered by General Hancock to charge down a hill into 1,800 Alabama soldiers moving up the hill. General Hancock needed time to rush in reinforcements to counter the 11000 man force forming behind the Alabaman's that were rapidly moving into positions to flank the Union lines -- "five minutes time," he'd write later. So he ordered Col. William Colvill and his men to charge the larger Rebel force to gain time to get his reinforcements into position. 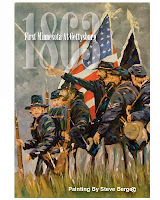 “Every man in the first Minnesota realized in an instant what that order meant; death or wounds to us all, the sacrifice of the regiment, to gain a few minutes’ time and save the position and probably the battlefield," wrote Lt. William Lochren of the First Minnesota. Though the Minnesotan unit was outnumbered five to one they did not hesitate and lunged forward with fixed bayonets in a spectacular charge that could in all fairness be called suicidal. The Alabamans were disorganized and winded after charging nearly a mile, and the sudden attack by the small group of Minnesotans caught them off guard. The Confederates were momentarily thrown back; but they regained cohesion, and then delivered staggering fire into the Yankees. The First Minnesota was virtually destroyed within ten minutes. Only 47 soldiers made their way back to the ridge. Colvill was seriously wounded, one of 215 casualties. The Rebels were repelled and Hancock succeeded in bolstering the Union line with reinforcements in that 10 minutes--but at a great sacrifice. 82 percent of the First Minnesota men were killed or wounded the highest casualty rate of the any American unit in any war. Hancock succeeded in bolstering the Union line with reinforcements in that 10 minutes, and the Alabamans were forced to retreat. "I would have ordered that regiment in if I had known every man would have been killed," Hancock wrote. "It had to be done." "They had not taken the Alabama flag, but they had held on to their own,' Historian Shelby Foote wrote. "And they had given Hancock his five minutes plus five more for good measure." Decimated as it was, the First Minnesota was not finished fighting at Gettysburg. Two companies that had been detached from the regiment, rejoined the unit, bringing the numbers back up to 150 men. On the third day of the battle, the Minnesotans were called in to help smother Pickett's Charge -- the climatic Confederate attack led by Gen. George E. Pickett. The First Minnesota suffered 45 more casualties, but Pvt. Marshall Sherman managed to capture the colors of the 28th Virginia. This flag which I have seen is today at the Minnesota History Museum. This acrylic painting measures 24"x 36" and the original is still available. 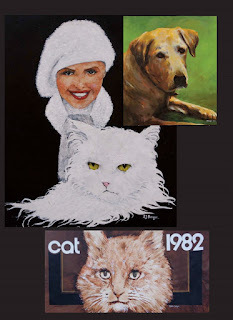 Signed Giclee prints with an image size of 20" x 15.5" are available for $250.00. Other sizes are available with framing options. Email me at steve@bergerfinearts.com if interested. Well you can sure tell its election time. A lot of interest in this print with the included speech from JFK dated September 14th 1960. 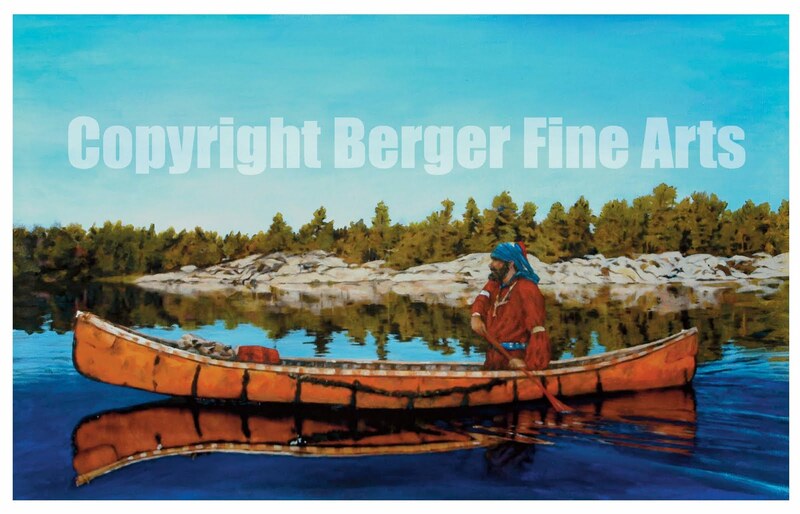 So here it is a limited edition run of this 17" and 3/4" x 26" image area only Giclee print for $125.00. 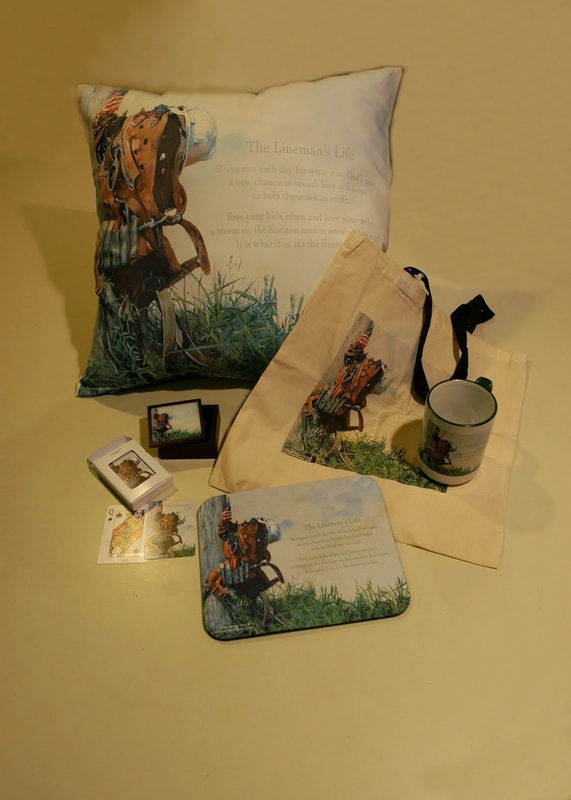 Each piece is signed and numbered and is guaranteed to be a draw in any room it occupies. If you need framing options please let me know and I can show you and price a style that fits the piece. After Painting sports legend Vince Lombardi and Marilyn Monroe the famous screen actress I had to finish the famous celebrity series with a political icon. 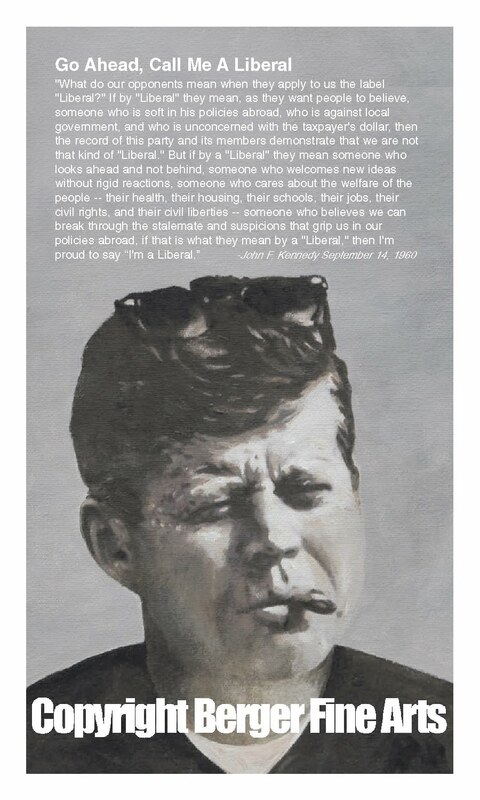 JFK was a natural choice for me, Abe Lincoln was close and I actually started one of Abe but with the Marilyn Monroe connections and the lack of JFK portraits in a natural setting like this the choice was made much easier for me. I will finish Abe later and post here. This JFK original measures 18" in length by 9" wide and is painted in colors that reflect the other two paintings in the series. 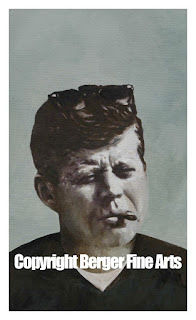 The image painted I think fits the personality of JFK and his tone of politics. If you are looking for a series of original art to finish off a media room or entertainment area this is the series that will always draw comments. 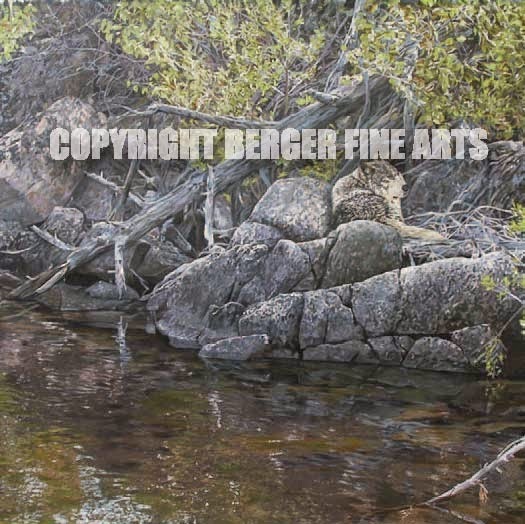 This image is for sale and signed limited edition Giclee prints are available at the original size for $180.00. 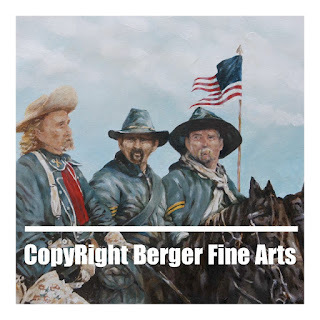 Email: steve@bergerfinearts.com to order. After a disappointing sweep of the Twins by the New York Yankees I was compelled to paint this picture of Babe Ruth. Read into it what you will. 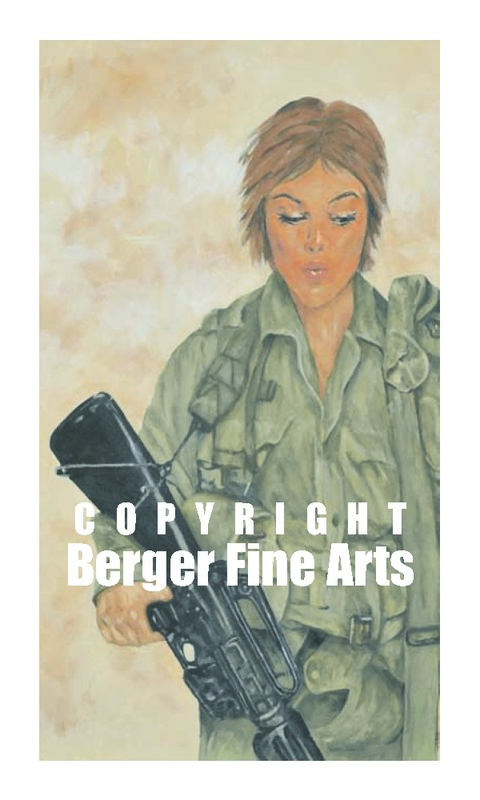 This image is slightly cut off at the bottom but signed Giclee prints are available of this 7.50x15" acrylic painting for $125.00. Mailed in a shipping tube this print is sure to bring comments to any room. Allow a week for delivery. 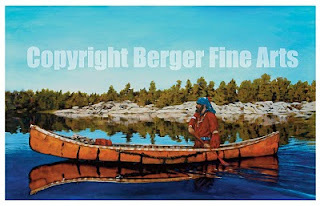 Contact: steve@bergerfinearts.com for orders. Visa & MasterCard accepted. I just can not seem to get this painting done the way I want it. 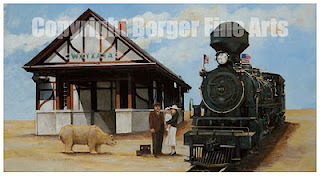 So here is the night version of the Wayzata depot circa late 1800's. I now have a day and a night version and am not working on modern day version anytime soon. It seems to me that their are many current versions of this historic depot. 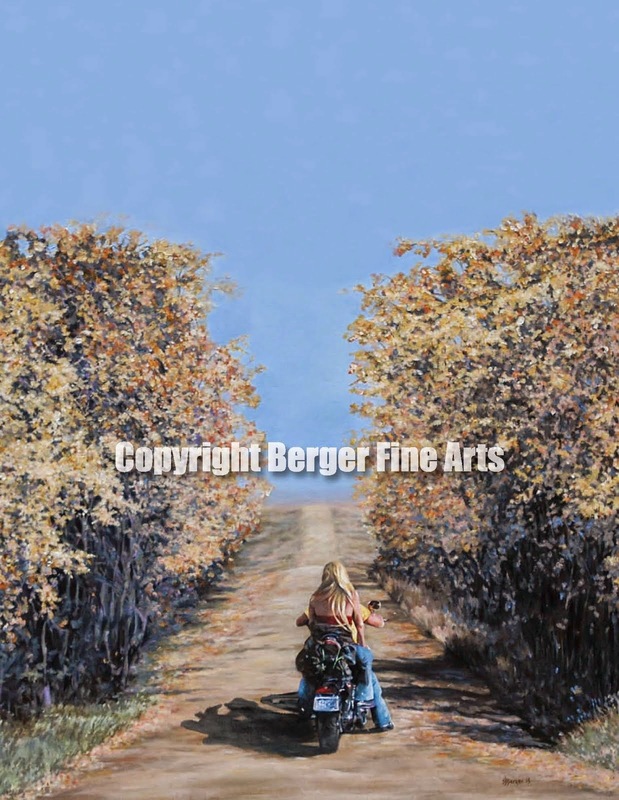 Prints will be available just contact me at: steve@bergerfinearts.com. and let me know the size you are looking for. I had to add this one to my second of three celebrity paintings especially since football season is just around the corner. The colors of this on the original of this painting are much different than what shows here but monitors can never reproduce color accurately anyway. This is another black and white look at a legend of the sixties. This will probably mean the third painting of this series should be black and white too. Painting with a limited palette of colors is fun, refreshing, challenging and very rewarding when it all pulls together. I like this paintings simplicity. 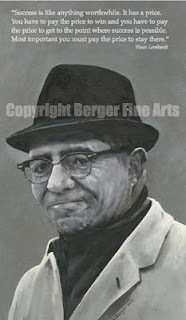 I think this basic image evokes the simplicity of Vince Lombardi's views and approach to football and life. From what I understand of Mr. Lombardi he may have been a complex personality to understand but his complicated personality understood how to get the best results from people. His basic philosophy was to break complicated tasks down to their simplest of components in order to perfect techniques through repetition and familiarity. His ability to do this is what made him a great coach. In my opinion anyway. 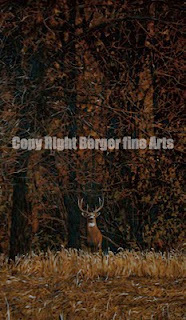 This is a painting I just finished for all the avid deer hunters out there. You know who you are and you know this picture, its the scene you can't ever get out of your mind. You have been out hunting all day and are just about to call it quits when you see the one that you wait all your life to see. The king in front of his castle, staring right back at you. In a second he was there and just as fast he disappears back into his castle. Now you get the essence of this painting and the reason it is titled "A King Leaving His Castle". This JPEG Image to the right does not due justice to the colors of the original but at least you will get an idea of what it looks like. 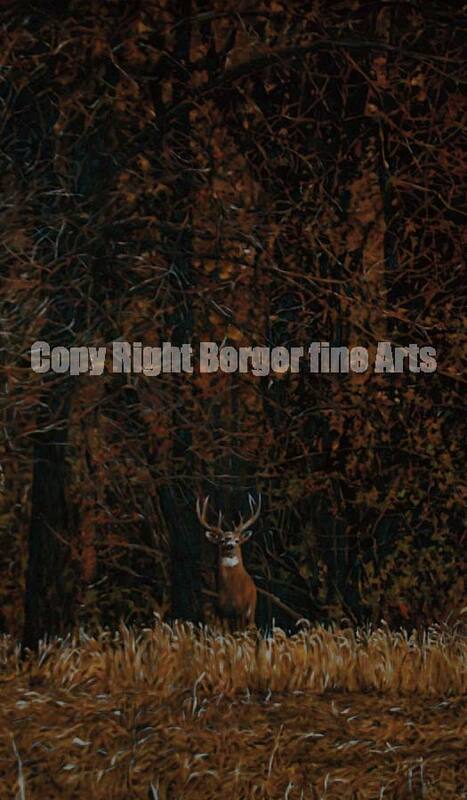 The original painting measures 17"x24" and when framed is very impressive whether you are a deer hunter or not. 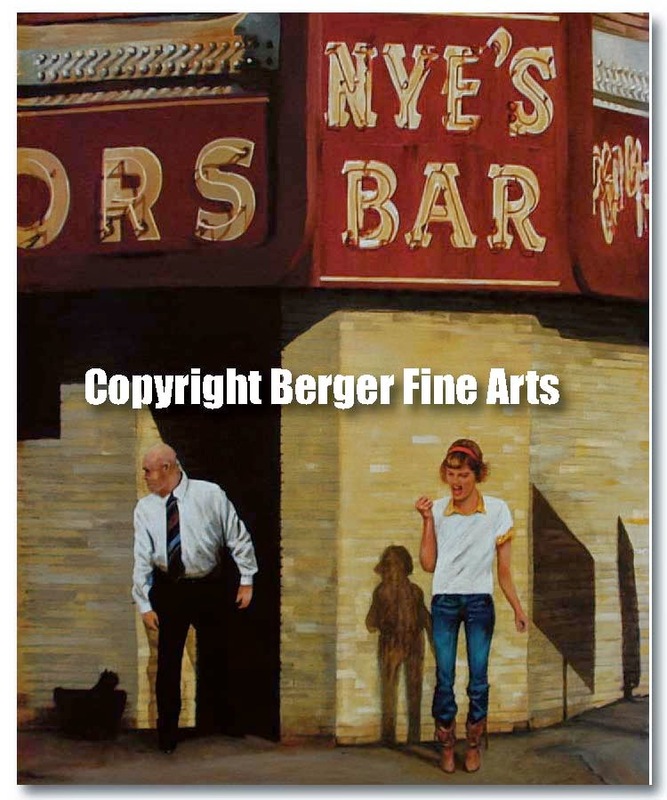 Signed Giclee print of this painting are available in the size of 15"x22" for $150.00. 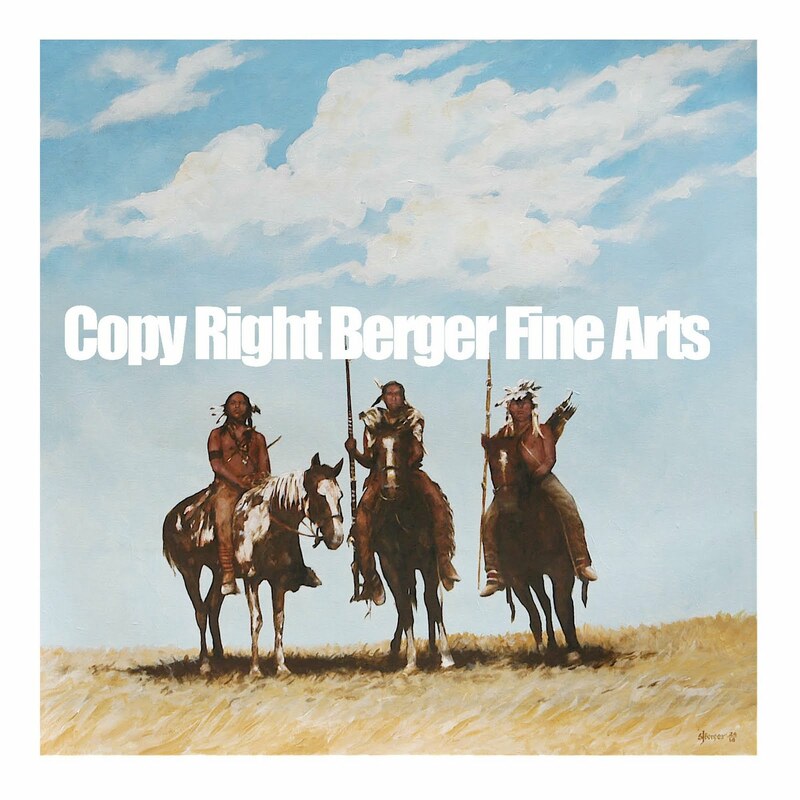 Email: steve@bergerfine arts if interested in purchasing or other available sizes. Oh, and Mike B, if you are out there this ones for you. Never say never. I have been wanting to paint a celebrity portrait for sometime and why not pick a cultural icon like Marilyn Monroe. To keep it simple I used a black and white pallet with some tinges of yellow and I really like the effect. 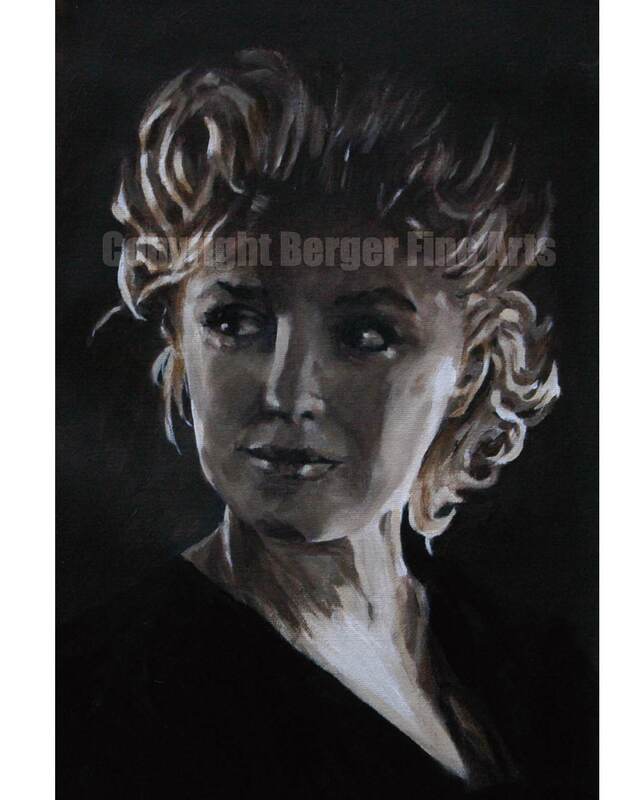 This painting was interesting and fun to do because of the two light sources on both sides of Marilyn's face that can show her facial features starkly and still give the feeling of softness because of the subtle use of face shading. The title for this painting is "The Look" and what I wanted to convey through this image is a feeling of confidence and awareness. 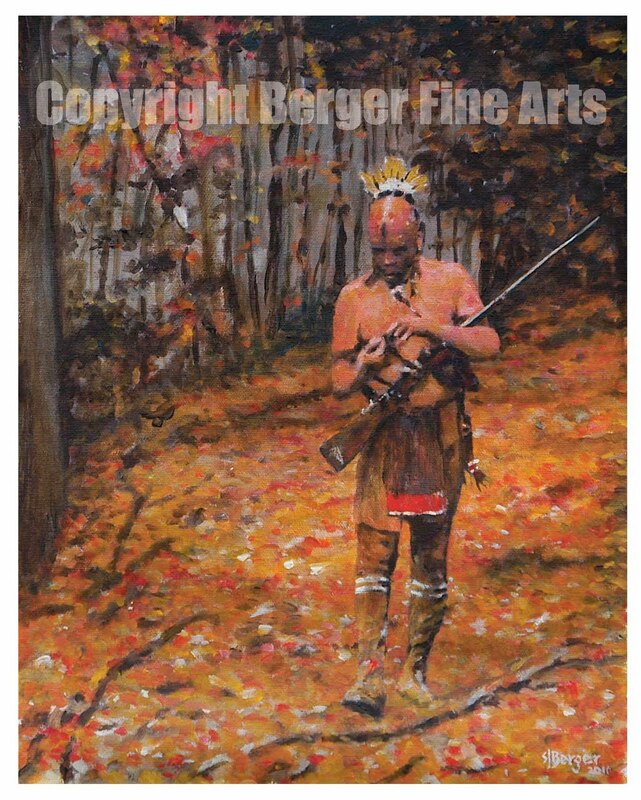 Signed limited Edition 11x17 giclee print of "The Look" is available for 150.00. 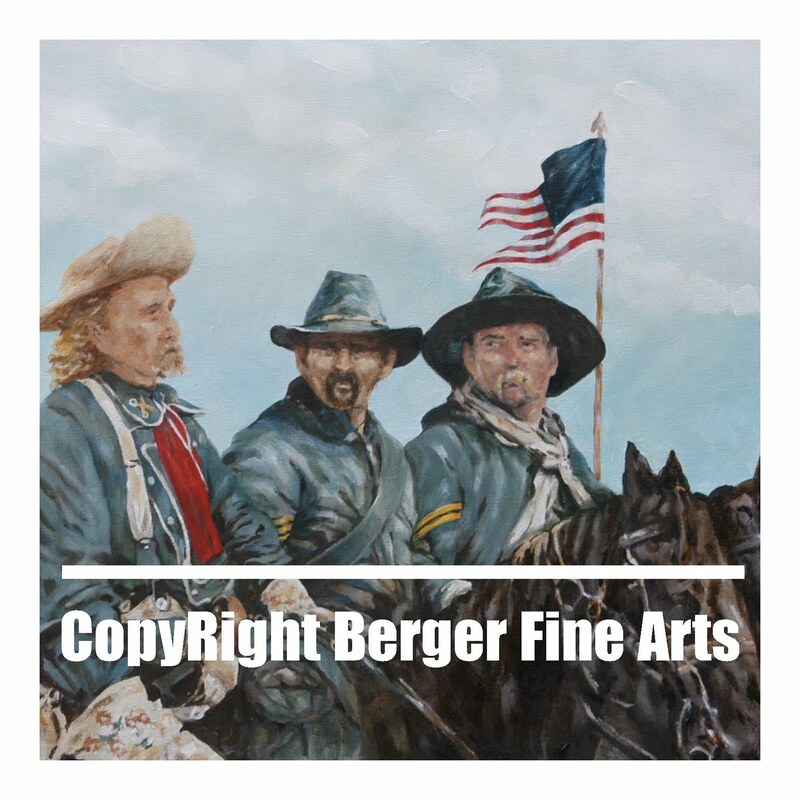 Contact me at steve@bergerfinearts.com and leave your contact information so I can get back to you about shipping, framing, sizes etc. Labels: Marily Monroe "The Look"
This is the first Wayzata Depot painting I did. Sometimes I will do a number of views to get the right feel for the completed painting and I usually do not publish the "other" study paintings but I had to publish this one here. I am not sure when it happened but somewhere in process this view and this painting started not feeling right and well you will have to look at this one and judge for yourself. Maybe I should have kept going with this painting but I decided to stop. The previous blog post is where I ended up so you can see for yourself where this painting ended up. I have had a lot of comments on this painting as people pass by it. I recently was in Wayzata Minnesota and looked at the historic railroad depot nestled right in downtown of Wayzata. This building has existed since the late 1800's and considering the histiry it is in remarkable shape. I wanted to capture the spirit of the building but after reading some of the history to paint it accurately I had to do some research. 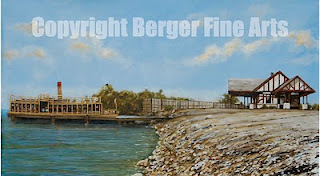 This painting is based on photos dating back to the late 1800's and the scenery around the depot has changed dramatically. There were no trees or groomed lakeshore at that time. 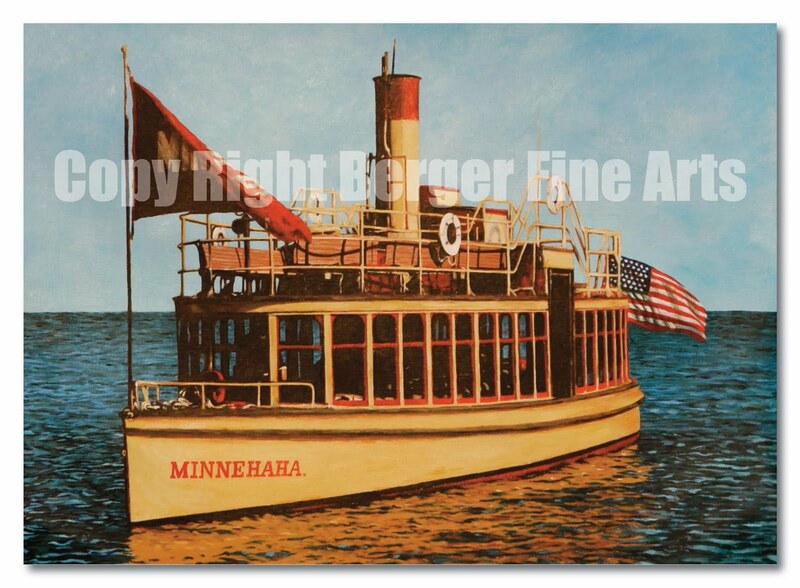 This painting represents that time with a transport boat "Minnehaha" at the dock waiting for passengers in its yellow and red colors. I still have some finishing touches to this painting but prints are available. 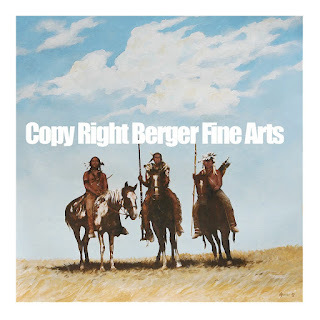 Please email me at steve@bergerfinearts.com. 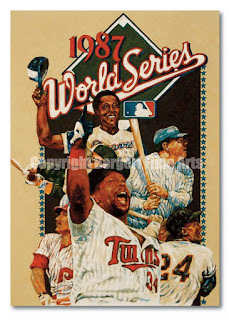 As the Twins make their way to the playoffs (I hope) I was reminded of the 1987 Twins team that won the world series and how important Kirby Puckett was to that team. I found my old tickets and looked at the cover of the program for that World Series held in the Metro dome and thought wouldn't it be neat to put Kirby with his hand held high showing that the Twins won the 1987 series and that team finally brought a world championship to the Twin Cities. What I wanted to do was to create a painting that combines the images from the program cover the 1987 World Series logo and Kirby showing the Twins won the 1987 series. Here is the painting as it stands now and I might add this photo to the right does not do the colors in the original justice but I do feel the painting captures the electricity and emotion that was part of that memorable series between the Twins and the St. Louis Cardinals. 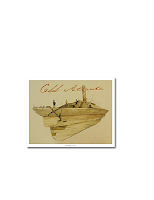 A limited edition of 100 signed Giclee prints are available for $150 each. The original art measures 17" wide by 22" and is also for sale. 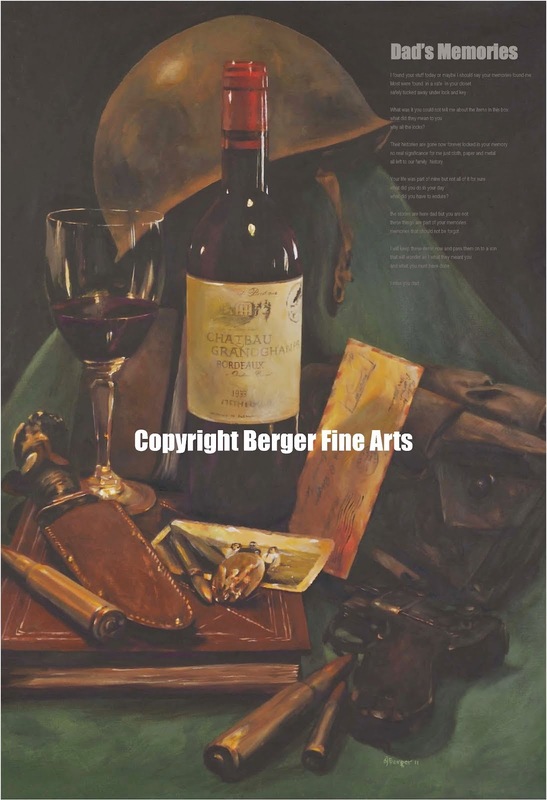 Contact: steve@bergerfinearts.com for size considerations, payment termas and delivery information. 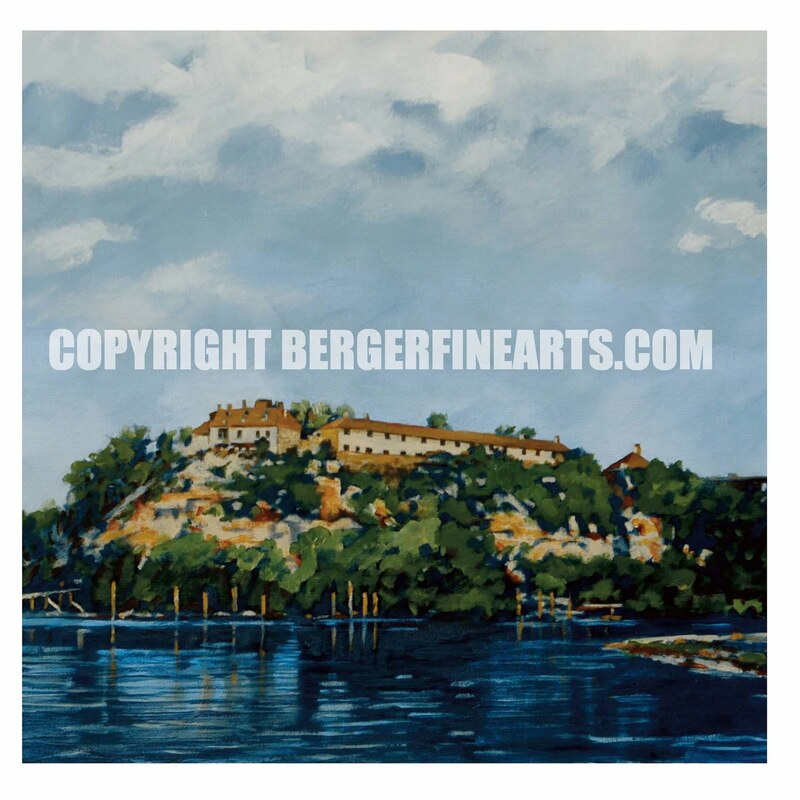 This is a little different view of Fort Snelling. The style of this painting is not as detailed as my other stuff but when I reached this point I just really liked the way the colors and the painting looked so I stopped before I screwed it up. Robbinsdale Minnesota landmarks are hard to come by. 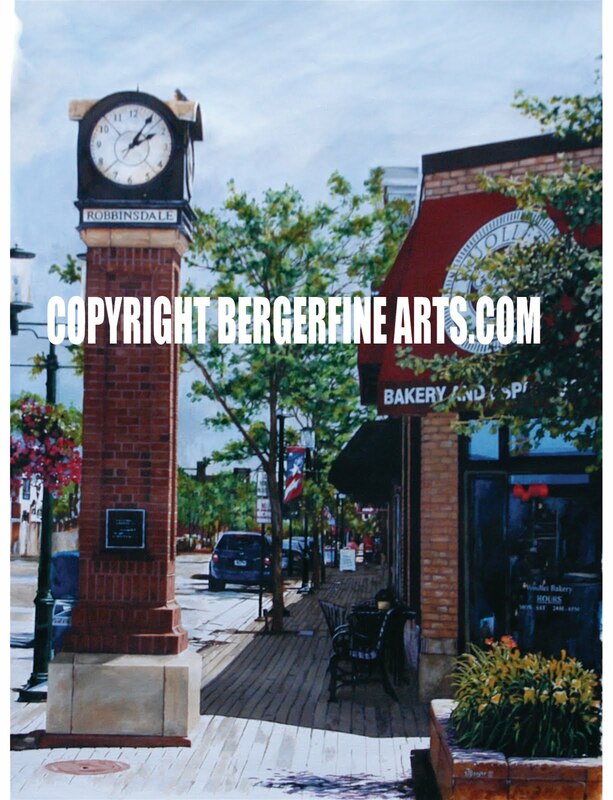 This painting is a followup to the Robbinsdale watertower painting I did earlier in the year. 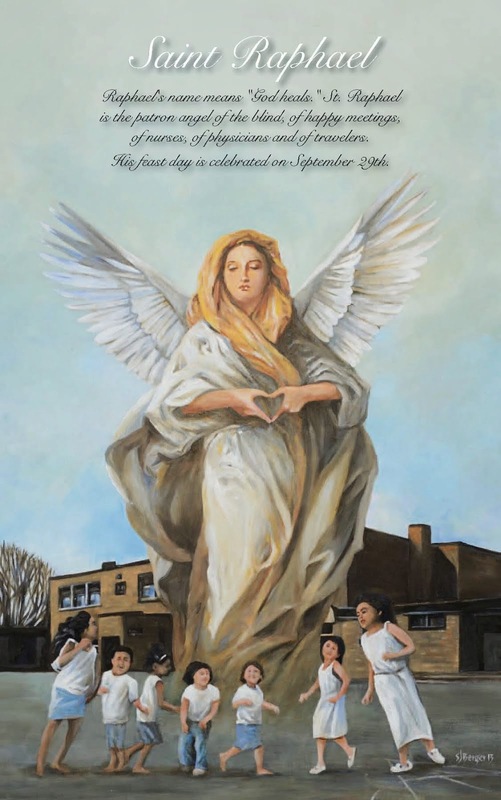 Downtown and Wiz Bang Days celebration were the inspiration for this painting. I tried to capture the shadows of a typical summer day in downtown Robbinsdale and of course a robin on top of the clock. This is part of a series of small metro downtown paintings I would like to get done this summer. Wayzata and or Hopkins is next. 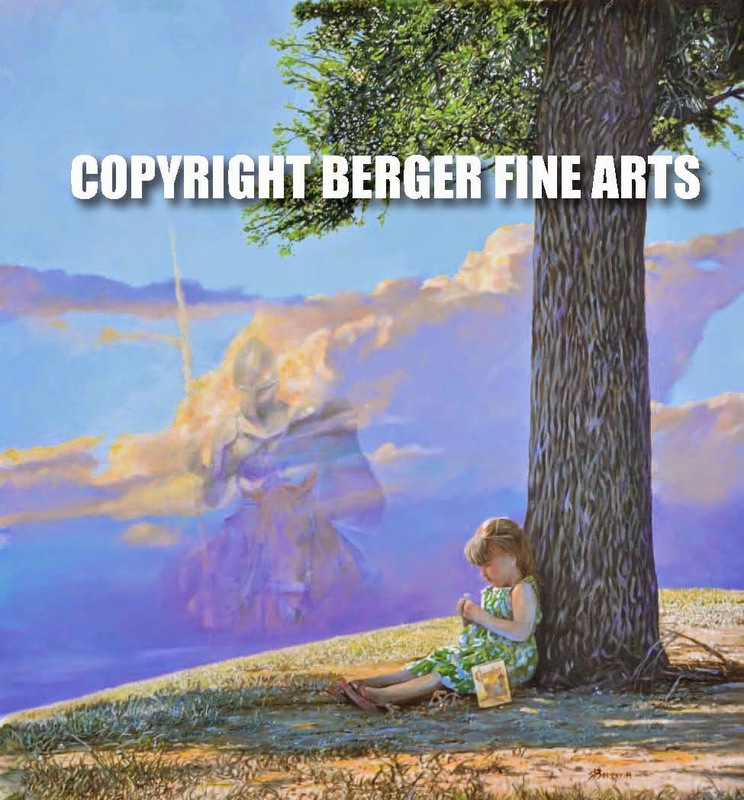 Prints will be forthcoming and if you are interested in prints please feel free to contact me at (steve@bergerfinearts.com) and I will make sure I can give you the size you want. 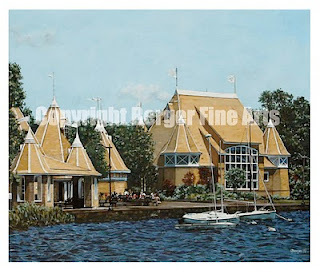 I took a break from history to paint a current landmark the band shell at Lake Harriet. It has been a while since I painted architecture I use to do a lot of wooden barns in Iowa before they would disappear into rubble. No two barns were created the same. All were unique and that is what made them interesting to paint and draw. The details were amazing. But this painting was definitely fun to do. Talk about details in buildings this band shell has a bunch of character details. The day at the lake sketching and getting color ideas did not hurt either. This is a recent painting I did to go along with the Fort Snelling painting "series" which I have not posted here yet. The series depicts different scenes about the post as it appeared in 1848. Of course the Dakota people were a big part of the comings and goings of the settlement. 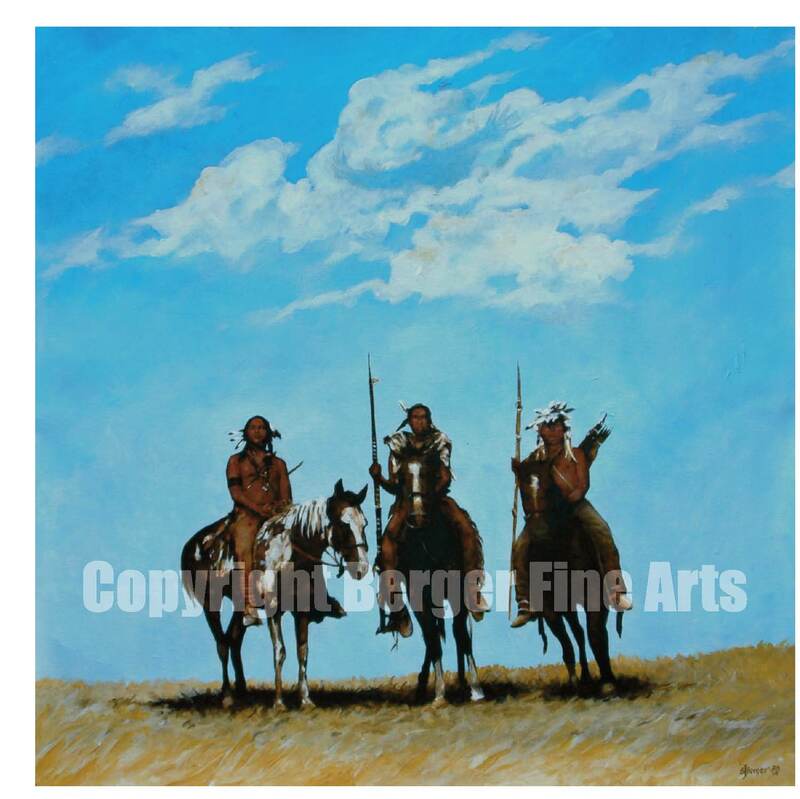 This scene shows three Dakota warriors observing from afar. 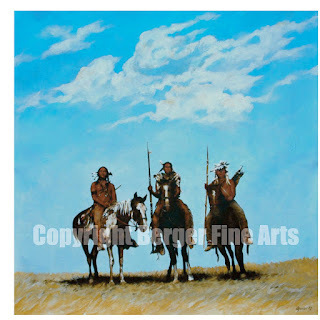 Just enough detail in the painting to evoke the distance between the two cultures the openess of the territory, both represented in this painting with the big sky and open prairie. Notice also that the sun is positioned to cast short shadows representing high noon on a hot summer day in northern Minnesota. I am sure this scene was played out many times in the 1800's, it was fun to paint while thinking of how it must have been to be alive during those days. This original of this painting is roughly 3'x3.5 and 2'x2' Giclee signed canvas prints of this painting sell for $195.00. Free shipping of course. 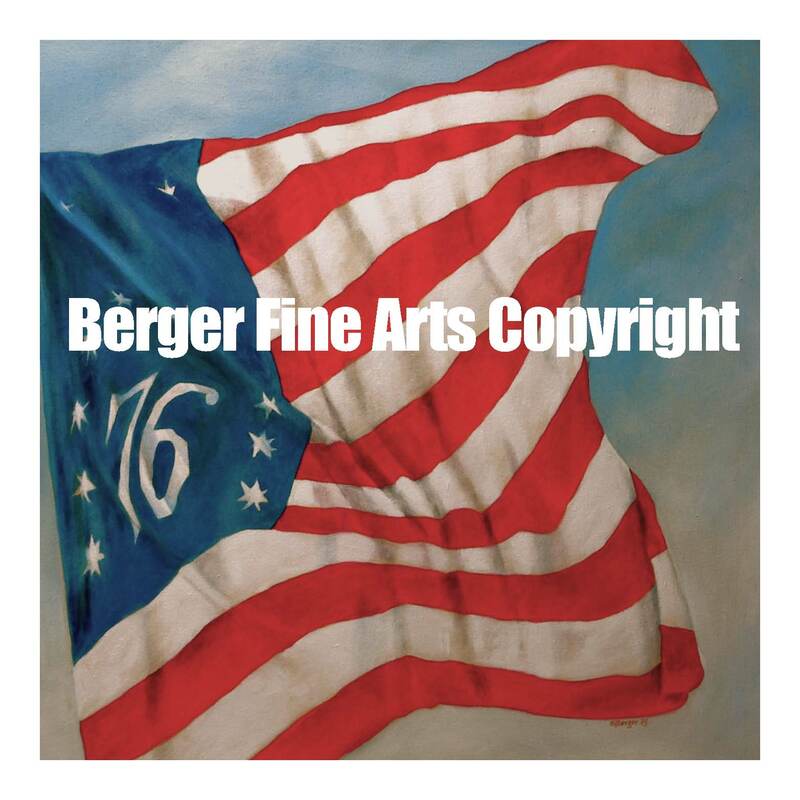 Email steve@bergerfinearts.com to order. Bennington Flag Real or Not? 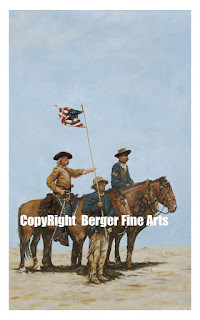 This is another 4'x4' painting for the American Flag series. I did a smaller version of the Bennington flag but I wanted to do a larger one for the collection. The history behind this flag is interesting. 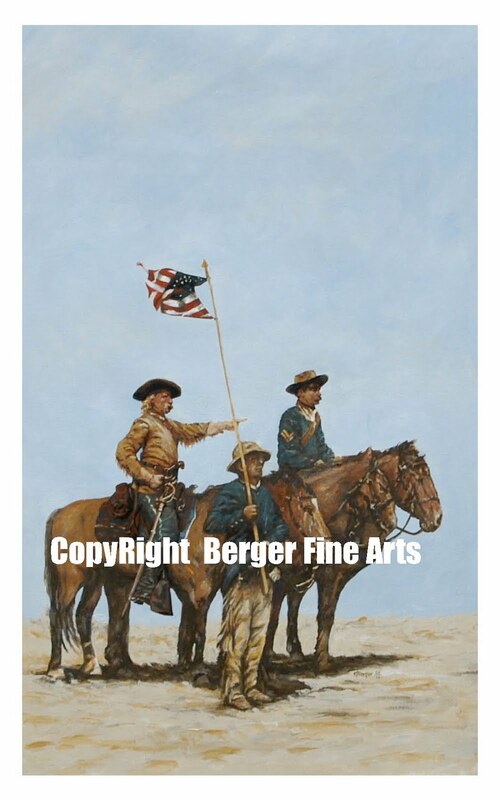 The Bennington Flag large '76' makes it easily identifiable as banner from the American Revolution, and it seems every one has seen this flag at one time or another. A legend claims that the original Bennington Flag was carried off the field by Nathaniel Fillmore and passed down through the Fillmore family, and was, at one time, in the possession of President Millard Fillmore, Nathaniel's grandson. Philetus P. Fillmore flew a Bennington flag in 1877, to commemorate the Battle of Bennington. Mrs. Maude Fillmore Wilson donated the family flag to the Bennington Museum. Because of the family association, the flag is also referred to as the "Fillmore Flag". 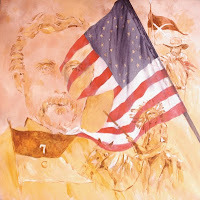 Many doubt the actual use of the Fillmore flag at the Battle of Bennington. 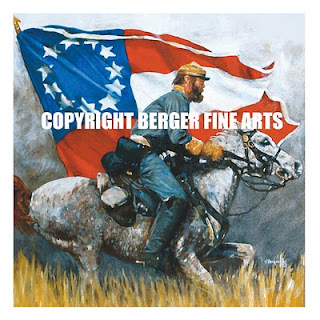 The flag of John Stark's Green Mountain Boys is generally accepted to have been there, but the Bennington flag has become more strongly associated with the event. Both Stark's flag and the Fillmore flag are held in a collection at the Bennington Museum, but the Stark flag is accepted as an 18th century regimental banner, while the museum has dated the Bennington flag from the 1800s based on the nature of the machine-woven fabric it is made from.The curator of textiles in the Smithsonian Institution's National Museum of History and Technology speculated that the flag may even have been a centennial banner, made circa 1876. If this is true than this flag is historic but it represnts a different era than what people think it represents. I will go with the Smithsonians observations. 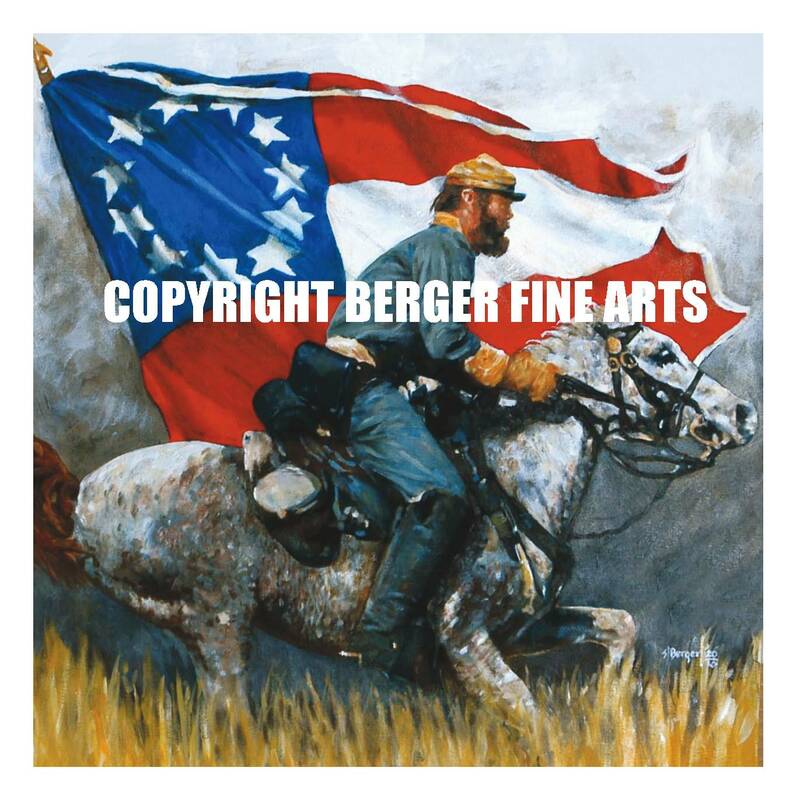 2'x2' Giclee canvas reprints of this artwork are available for $165.00 email steve@bergerfinearts if interested. Free shipping of course. Labels: Bennington Flag a Hoax? This is a painting of the wooden steamboat Minnehaha. This boat was built in 1906 and was powered by steam. It would cruise lake Minnetonka a suburb of Minneapolis all summer long. As personal gas powered boats became popular the ridership of the Minnehaha decreased and the upkeep became to much of a factor to keep the economics of the boat cruising the lake. The decision was made to sink the boat in 1926. She stayed on the bottom until the mid 1990's where she was discovered again and raised from the depths. She was miraculously restored and has been in active passenger service 1996. What a great way to spend an evening on the lake. It may be a little slower but in the middle of summer everything is suppose to slow down. 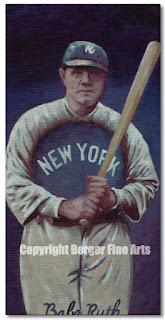 I am adding another sports painting that I recently finished. This one is of Joe Namath. Broadway Joe was a favorite of mine when he played for the Jets not the Rams. I had a chance to meet him on the field when he played for the Rams at the end of his career. This picture pretty well sums up how I remember Joe. Confident and in complete control of his game. This 12"x18" print will be selling for $150.00 signed. If interested in this print leave a comment with contact information below or email me at steve@bergerfinearts.com and I will get back to you. I had to do this one just for fun. This is not the finished painting but you get the general idea. The image is roughly 26" x 20" and it combines some fun imagery. Like I said in the previous post it is fun to be painting sports again. I hope it shows. This is a new painting I recently did to celebrate the opening day of the Twins home opener at their new stadium Target Field. If you notice this year the Twins have three logos in their marketing mix. 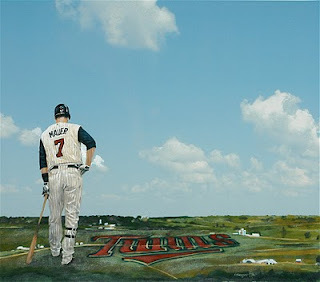 The circular one shown on the left in the painting is celebrating fifty years of baseball in the Twin Cities. The smaller one in the upper right is celebrating the opening of Target Field. The one in the lower left is the new signage that is in center field of Target Field that shows the twin city dudes shaking hands. And lastly in the bottom right is the original Twins Cities logo. Putting a local Minneapolis hero Joe Mauer in front of the whole bunch is only right. The Twins should be fun to watch this year. 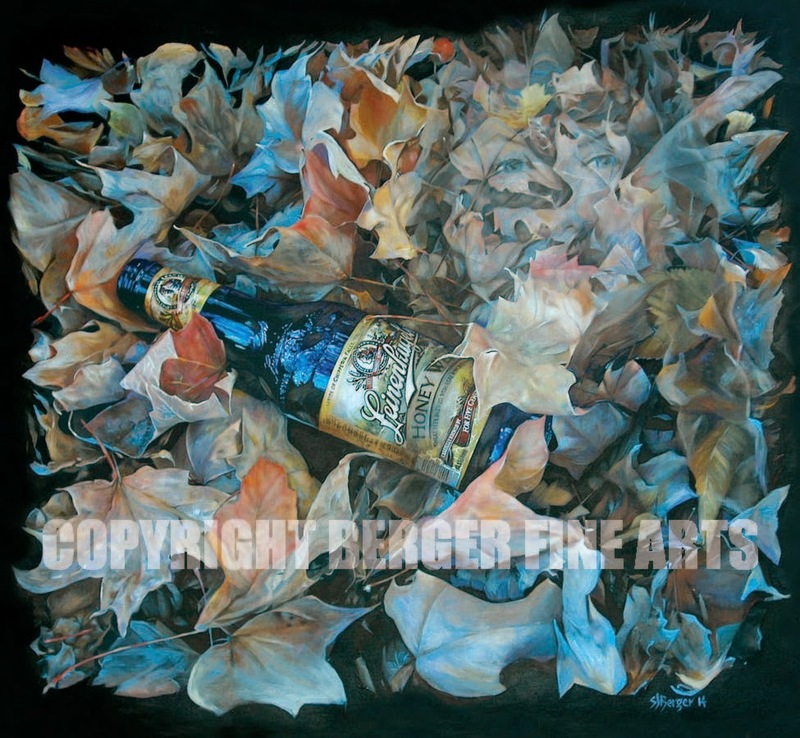 This Giclee print is for sale for $75.00. 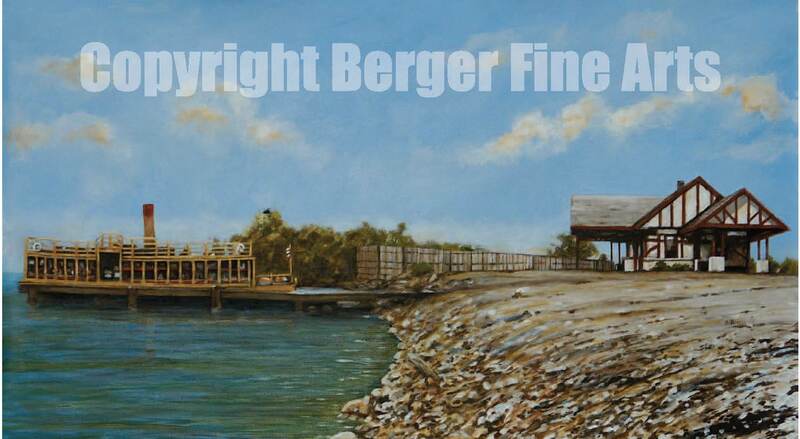 Email me at steve@bergerfinearts.com. or leave a comment that you are interested with your contact information. It is actually a lot of fun painting sports figures and events again mostly because I think it has been so long since I painted them. In the early eighties I did a lot of stuff for Viking players and every now and then I will see one of the old guys and say hi to them. Wes Hamilton who was an offensive guard at the time and is still local and has a painting of mine as well as defensive tackle Mark Mullaney. I saw Carl Eller the other day too. There were a few of them. 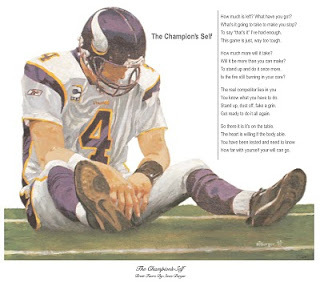 I still have a Fran Tarkenton original that Fran signed. There were some real charachters in the day.